Taking your precious child to its first baby swimming lessons can be understandably nerve-wracking for many parents. So take a look below at the ten tips for making sure swimming is a memorable and enjoyable experience for both you and your baby. 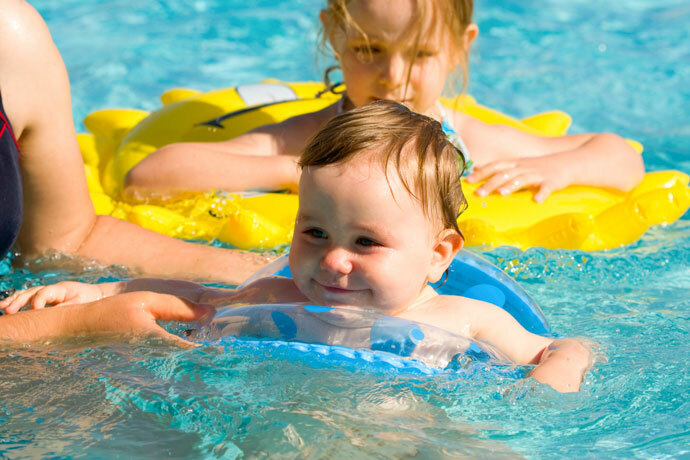 With some preparation your first baby swimming lesson will be memorable for both you and your baby. 1) Make sure you are swimming in a warm water pool heated to at least 30°C (86°F). If you are swimming in a pool cooler than this, it is advisable to use a special baby wetsuit or snug which can add up to 2°C (3.6°F) to the water temperature for your baby. Hydrotherapy pools are perfect for babies, and they can swim from birth in them. In a regular swimming pool you should wait until they are 12 weeks old, or 12lb in weight – whichever comes first. 2) Ideally, you should leave 30 minutes from a milk feed before taking your baby swimming; an hour for older babies on solid food. Having said that, it is not always possible to plan when your baby is hungry, so do not fret too much over this. 3) Most local leisure centres will allow you to swim your baby in just a disposable swimming nappy. However, these will not contain those explosive poo’s! We recommend a double nappy system which consists of an under-nappy, with a second swim nappy over it. The under-nappy can be a disposable one – for example Huggies Little Swimmers, or you can buy reusable from companies such as Splashabout and Konfidence. On top of the under-nappy, you’ll need an over-nappy. Our favourite is the Splashabout “Happy Nappy” which is made of neoprene with extra snug cuffs around the waistband and thighs – making sure any accidents stay inside! Incidentally, it is worth noting that swimming nappies are not waterproof! Do not change your baby until you get to the pool. 4) It is not necessary for you to be able to swim, in order to take your child to baby swimming lessons, but you need to be comfortable in the depth of the water – check with a lifeguard or instructor at the pool if you are unsure about depths. 5) It is not necessary for babies to have had their immunisations before going swimming. 6) Phone ahead to see if your venue has a playpen or travel cot in the changing rooms – again these can be a great help when you are getting changed. If you are swimming with a baby swim school and they do not have this facility, ask them if they can provide one. 7) In terms of logistics, some local leisure centres/municipal pools do allow you to take buggies to the poolside, or they may have a buggy park. These make life much easier and again it’s worth checking before you get there. 8) Before going to the pool for the first time with your baby, call and ask what the parking facilities are like – are there mother and toddler parking bays. 9) Mums might find it easier to put their swimming costume on before leaving home. And don’t forget some milk or snacks for your child as they’ll be hungry after their lesson! 10) And finally – enjoy it! 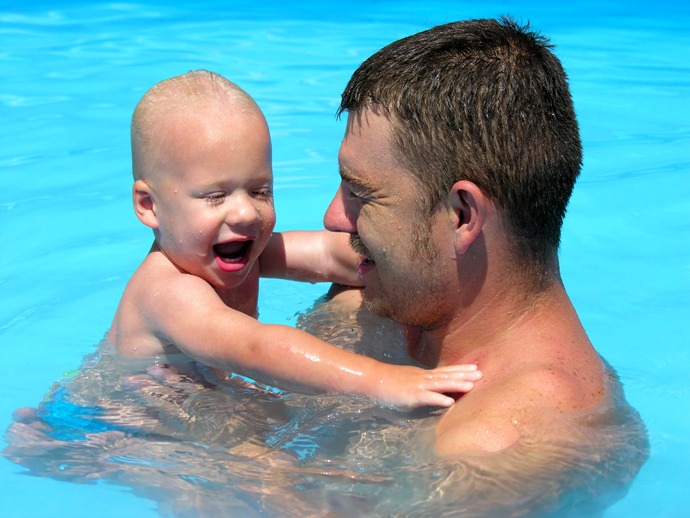 Attending baby swimming lessons with your child is a great bonding experience for both of you (don’t forget Dad too!). Swimming to Lose Weight – Does It Work? Caroline Sparks and Gaby Lixton founded Turtle Tots in Bristol, United Kingdom in 2011. 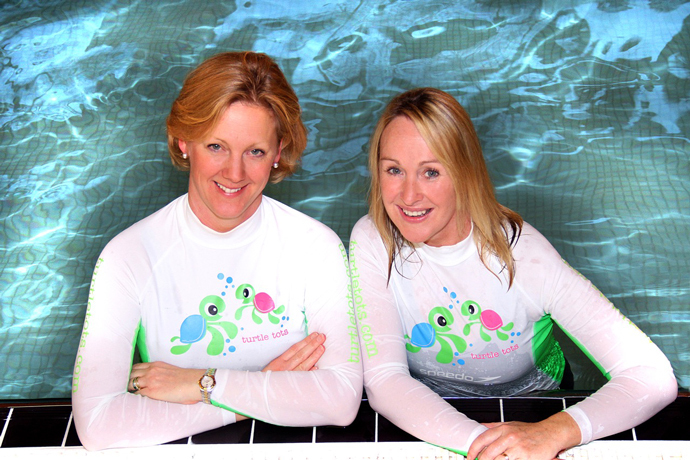 Before launching Turtle Tots as a licencing company, Gaby Lixton was one of the first franchisees for a well-known baby swimming company in the UK, teaching over 1000 babies a week with a team of teachers. Gaby is not only a swimming teacher, but also a qualified swim teacher tutor, and has years of experience teaching babies and toddlers. Caroline Sparks has a background in marketing and communications management and has been involved in the baby and toddler industry for over seven years running events and exhibitions, before joining Gaby to launch Turtle Tots. We took our daughter swimming for her first time when she was around three months old. She didn’t love the water at first, but after a few times she would just giggle and smile the whole time! She just turned one, and we really want to get her back out in a pool. I love the idea of doing a swimming class with her! Thanks for a great list of tips! I had read your blog at the right time and we had a really memorable and enjoyable experience with our baby at the pool. It is best to teach your kids how to swim why they are still young. They can definitely use it when they grow up. You can also ensure that your kids know how to swim when they will go to pools or beaches. Thanks for sharing these useful tips about baby swimming.